Central station UNET can be integrated into existing hospital information network and exchange data with bedside monitors using common channels of the local network. That kind of centralized monitoring network structure allows adding information on the current patients monitoring into the Healthcare Information System (HIS), as well as having an access to HIS databases from the central station. This central monitoring station enables combining current information received from UM 300 patient monitors located in operating rooms and intensive care units, and centralized monitoring vital signs of all the patients under monitoring. Central station UNET is designed to provide centralized vital information monitoring from multiple monitors and/or telemetry transmitter. Central station is a powerful computer with one or two color displays (diagonal least 17? ), with a sound alarm system, laser and thermal printers. Central station UNET enables bed-to-bed viewing of alarms, waveforms, numerical values and trends between network monitors. Built-in calculator for potion input and speed of infusion therapy. It is well known that monitoring of the patient's vital signs at all stages of hospital treatment in acute situations is extremely important nowadays. Monitoring is required for patient transporting from accident site to the hospital for providing first-line care, for hospital emergency departments (Emergency Department (ED), Emergency Room (ER)), Preoperative Area, Operating room (OR), Postoperative Unit (PACU), Intensive Care Unit (ICU, CCU), for patient reallocation between care units within the hospital. At each of these stages a different set of monitored parameters is required, ensuring necessary level of monitoring the situation. Each specific clinical situation dictates specific requirements for the dimensions of devices, their weight, method of visualization, period of autonomous work. Besides at all stages of treatment patient monitoring information must be stored, continuous for all patient reallocations between care units and available for remote viewing both in real time and historic perspective. Central station UNET is designed for centralized monitoring of vital patient information received from several monitors, patient database creation. Simultaneous use of all system elements allows receiving patients information in the right place, at the right time and in the right volume. During patient in-hospital transportation information from UM 300-10 portable patient monitor is received by the UNET via wireless connection. Further at patient's arrival in the operating room, connection is established between UM 300-10 and UM 300-15 monitors synchronizing monitoring parameters. Data transfer with extended parameters continues from UM 300-15 patient monitor to Central Station via both wire and wireless connection. Information received by Central station is accumulated in patient database and can be transmitted both to any network monitor and other Central station. 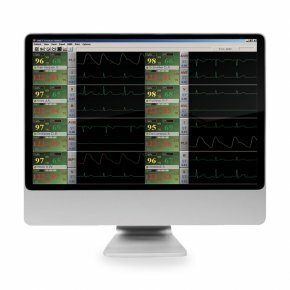 Web Viewer — remote access to the monitored patient parameters from any network monitor in real time mode or in trends. SMART-NIBP non-invasive blood pressure measurement technology. Clinicians can quickly check patient’s status directly from a standard PC, Mac or tablet PC,a wireless, pocket-sized Personal Digital Assistant (PDA) or smartphone. Web Viewer is capable of displaying real time patient monitoring data such as waveforms, alarms and numeric including printing facilities. Web Viewer can use any type of technology; wire, wireless, mobile. Web Viewer software adds web-enabling capability to the Central Monitoring Station. Now, physicians can quickly and easily access current vital patient data from remote locations or anywhere that has internet access.